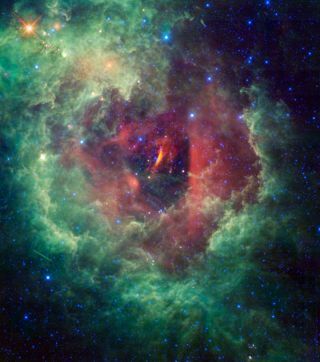 A NASA space telescope has snapped a stunning photo of a huge, flower-shaped cloud of dustand gas about 5,000 light-years from Earth. The nebula,also known as NGC 2237, has a cluster of young stars at its heart. The mostmassive of these stars produce huge amounts of ultraviolet radiation, and theyblow strong winds that erode away the nearby gas and dust. This creates thelarge central hole seen in the image. The streakat lower left is the trail of a satellite around Earth that crossed WISE's field of view as it snapped themultiple frames that make up the new image. Although the Rosette nebula is too faint to see with the nakedeye, it is visible through a small telescope or a good pair of binoculars. TheEnglish astronomer John Flamsteed discovered the Rosette nebula's central star clusterwith a telescope around 1690, but the nebula itself was not identified until astronomerJohn Herschel observed it almost 150 years later. The image is a four-color composite created by all four of WISE's infrareddetectors. Color is representational: blue and cyan represent infrared light atwavelengths of 3.4 and 4.6 microns, which is dominated by light from stars.Green and red represent light at 12 and 22 microns, which is mostly light fromwarm dust. The newimage is just one tiny piece of the massive sky atlas WISEtelescope isassembling. The satellite, launched in December 2009, is scanning the entiresky in infrared light during its 10-month mission. Astronomers hope WISE willuncover objects never seen before, including the coolest stars and some of thedarkest near-Earth asteroids and comets. WISEcompleted its main mission, a full scan of the entire sky, in July. So far, thetelescope has captured more than 1.5 million images, uncovering hundreds ofmillions of objects, including asteroids, stars and galaxies. It has observed morethan 29,000 previouslyunknown asteroids to date, more than 100 near-Earth objects and 15 comets. WISE isstill scanning, but it has encountered some age-related hiccups. A few weeksago, NASA reported that the telescope's secondary coolant tank is depleted,causing the telescope to heat up slightly. WISE relies on super-cold liquidhydrogen coolant to chill its infrared detectors, but it does not have anunlimited supply of the stuff. One ofWISE's infrared detectors stopped producing useful data once the telescopewarmed from 12 Kelvin (minus 438 degrees Fahrenheit) to 31 Kelvin (minus 404 degrees F). But theprimary tank still has plenty of coolant, NASA officials said. In May, a NASApanel rejected a proposal to extend WISE's mission for an extra three months.